67/ 68 Sts on Broadway~ Bel Canto is a very intimate, luxury boutique condominium located in the heart of New York City’s Cultural Center~ Lincoln Center- On the Gold Coast of The Upper West Side. No expense has been spared on this apt from the Seller- who has redesigned and recreated a Virgin-New-Mint-Gut Renovated apt-From A-Z. This immaculate Brand New apt is appointed with: 2 bedrooms, 2 baths and 2 balconies(at each end of the apt-LR & MBR). 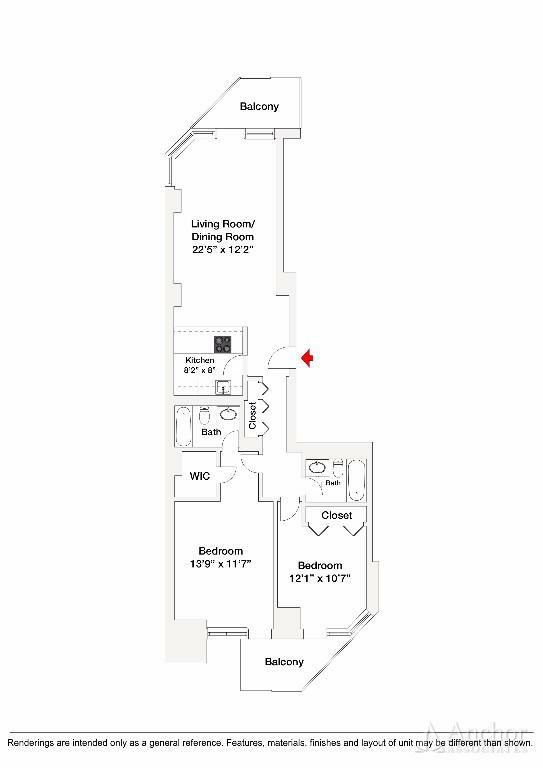 The apt layout is like a "Townhouse Floor-Through"- As it runs the entire width of the building from east to west- Enjoy the sunshine from Sunrise to Sunset. There are only 3 apts on this floor with the other 2 apts at the other end of the hallway. Apartments are separated by 2 elevators, a staircase and a rubbish disposal room. Included in the gut renovation are: New real hardwood Herringbone floors and Big Picture Windows throughout. The new open kitchen has been widened with new stainless steel appliances and granite counter tops. The new sumptuous dark wood cabinetry give an amazing pop of style! The 2 new bathrooms feature: deep soaking tubs, white marble, new vanities, mirrors, floor and wall tiling and all top of the line fixtures. New HVAC units are installed throughout the apt- in each room- each with individual room thermostats. All the closets are new inside and out and have been customized. These include a walk-in closet in the master bedroom suite. Living at Bel Canto, you’ll be surrounded by world famous dining, shopping and the best of cultural activities. Take a luxurious walk down Central Park or breath some fresh Hudson breeze at Riverside. Enjoy a spectacular opera at the Metropolitan Opera House- just a few steps from your doorway. Across the street is the 2nd highest ranked AMC Loews movie theater in the US where you can view Red Carpet Premier's from one of your two balconies in the apt. Also across the street is Equinox Health Club. Join and work out with some of the greatest Movers and Shakers in NYC, if not the world! The Apple Store is literally attached to the building. Walk seven blocks south to Columbus Circle and The Time Warner Center and experience world class restaurants, shopping and concerts! Transportation is "As Good As It Gets"-in all of NYC. You have maximum convenience and access within 1-4 blocks to the 1/2/3 and A/B/C/D Subway lines- will get you anywhere in NYC in no time! Bel Canto offers full service, a 24-hour doorman, live-in resident manager and an on-site resident laundry room. With its newly renovated hallways and lobby, the building features high end finishes, stylish looks and a unique, elegant atmosphere. Bel Canto also provides great sense of privacy, with only three apartments on each floor! The condo purchases Bulk Gas & Electric- (And the discount is approximately 50% of the cost of Con Edison electricity). Bel Canto allows pets, as well as guarantors, co-purchases, investors and pied-a-terres.